Trader #1 I have lost thousands trying to swing trade. For me, personally, scalping is the only way I consistently make money. You have to find what works for your personality type. Trader #2 I’m pretty sure you’ll find hundreds that trade either and claim one is better than the other. I might be able to post a 10% return per month swing trading but get crushed scalping. Does that mean scalping’s less profitable as a style? Hardly. I do swing and scalp depending on the market conditions. Trader #3 It’s a perfectly good question. A lot of people simply don’t have an answer, and instead of being quiet they claim that your question is invalid to make themselves feel better. I also don’t have an answer since I close trades based on time intervals, but I think it’s an interesting topic. 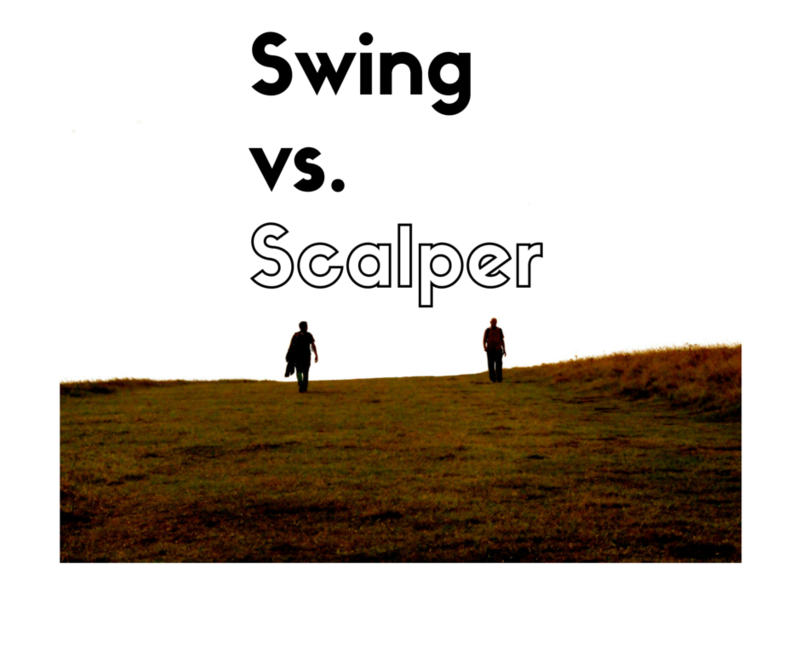 If I need to categorise my trading as one or the other, I would definitely go with Swing trading. Trader #4 Definitely a scalper then. I don’t like holding trades due to it taking on excess fundemental risk. I usually trade the first couple of European market hours and I’m done before any news release. Most of my trades are less than an hour. I find it helps to be In and out with my personality. Swing trading never worked for me – not that I can’t profit from it , more because I don’t have the patience for it. Trader #5 The strategy of scalping targets minor changes in the intra-day stock price movement to build up profits by frequent entry and exit throughout the trading session. It is sometimes seen as a subtype of the day trading technique; scalping involves multiple trades but with a very short holding period, few seconds to minutes. Since the positions are held for a very short period, the gains on a particular trade (or profits per trade) are small and thus scalpers indulge in numerous trades (even in hundreds during the day) to build up the profit. The limited time exposure to the market reduces the risk for the scalper. Despite that, I personally prefer swing. Scalping is best suited for those who can devote time to the markets, stay focused and act swiftly. It’s usually said that impatient people make good scalpers as they tend to exist from a trade as soon as it becomes profitable. Scalping is for those who can handle stress, take quick decisions and act accordingly. For me personally, swing trading works better. Trader #6 Scalping is way riskier, but might be more profitable in the short term. Swing trading is the way to go for most people IMO. Because that’s how I started out. Trader #7 Scalping offers more trading opportunities, which is good. Scalping also spends more on spreads, which is bad. It all depends on what your strategy is aimed for. I am a scalper myself. Trader #8 Swing trading. I get too nervous if I stare at the trading terminal for too long. Trader #9 I have done both and find that scalping/day trading fits my psychology however I can swing trade and have certain things I look for to get in on a swing trade. Don’t forget while a swing trader can net 2-400 pips on a trade remember there stop is 40,50 even 100 pips so they still hitting 1:2,1:3. Just like a day trader picking up 30 pips with a 10 pip stop (1:3 RR) with identical accounts and correct position sizing they should exit there trades with rough the same amount. Merely comes to which style fits there psychology better. Trader #10 You can scalp without bringing emotions into it, in fact you should minimize emotion when trading and base your decisions around data. I do scalp! Trader #11 Scalping and day trading; which differ slightly, can be stressful if each style doesn’t fit the traders psychology or trading plan. However when done correctly it shouldn’t be stressful, trading should become simple and boring and that’s where patience is needed so you stick to a plan and generate consistent returns. And to add that versatility is key as well. Someone who can day trade but also have signals for swings is a versatile trader and will often do quite well. After talking with a dozen of profitable traders, the results are a bit frustrating. There are 4 traders that prefer swing trading, 4 traders than prefer scalping and 3 traders that use a combination of both. It is hard to say which trading method is better or more preferred. There are different personalities and different ways of trading. As a result, maybe the most agile of traders are the ones that survive all market conditions. Maybe a combination of both styles can help you become the ultimate trader! Or maybe it is just sticking to one of those styles- Swing or Scalp- and not changing it no matter what. What do you think? What is your way of thinking? What is your way of trading?